Ran When Parked: Giulia GTC. 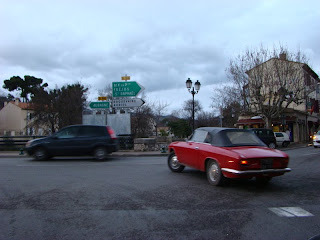 I had the good fortune of driving behind this rare Alfa Romeo Giulia GTC for a few kilometers outside of Aix-en-Provence in France a few days ago. 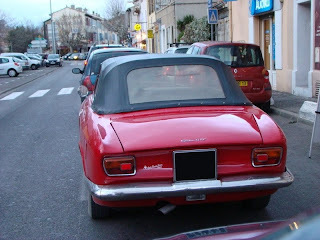 The plates were original-issue so the car has likely been in the Bouches-du-Rhône departement all its life. 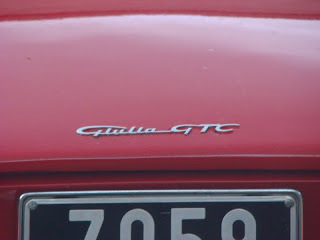 The Giulia GTC is basically a convertible version of the Giulia Sprint GT (or GTV, as it later became known). Only 1,000 of them were built by Touring from 1964 to 1966 when the Duetto was introduced.